Many Windows 10 users have been having trouble with System Restore. The System Restore was not completed successfully, and they ended up encountering error 0x80070091. This is annoying and stops you from doing other work. Don’t worry; we will try and find a solution to fix this error message. Well, before we could head to fix the problem, let’s see what causes this error message during system restore in Windows 10. The main reason for error 0x80070091 is bad sectors on the external hard drive. One way to resolve this is to run a disk check to fix the error. 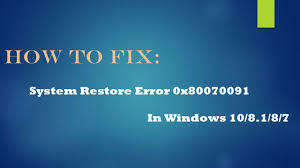 How to Fix System Restore Error 0x80070091 in Windows 10? This command might prompt you to restart the system. After rebooting, it will scan the entire drive for bad sectors and will start to eradicate them. So, if you want the disk to be checked, then press Y or else press N.
An important note here is to close all the applications and save all your work before rebooting the system. Also, when CHKDSK is been performed on your hard drive, the device might encounter bad sectors. When it encounters bad sectors it will try to fix them. This could lead to loss of data stored on the drive. So you need to always backup data stored on the drive before you perform a check on the disk. Suppose you haven’t backed up files and ended up losing data, then make use of Remo Hard Drive Recovery software to get back your files from the drive in a safe and quick manner. This tool helps to recover data after Windows 10 setup fails, after system restore, format / reformat, hard drive crash, repartition, and so on. So whatever the reason behind losing data from Windows 10 drive, Remo Recover software comes handy to retrieve all your files from the drive with ease.